1 negative : b&w; ; 4 x5 in. Mayor of Hiroshima, Japan speaks at San Kwo Low Chinese restaurant in Little Tokyo, Los Angeles, California, 1969. 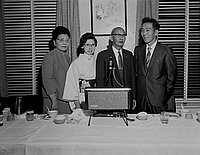 Elderly, balding Japanese man in suit and eyeglasses stands in behind podium on table flanked by two women, one in kimono, and a man in a suit, right; framed Asian art between curtained windows with blinds in background. Written on original envelope: Hiroshima Mayor at San Kow Low.